You are here: Home / News / How to... / The difference between Timber Decking and Composite Decking. The difference between Timber Decking and Composite Decking. Timber decking has proved to be a huge hit across the UK for many years now. It’s simple and straightforward to construct and has the ability to transform any back garden however, since the introduction of composite decking its become difficult to decide which option is best. 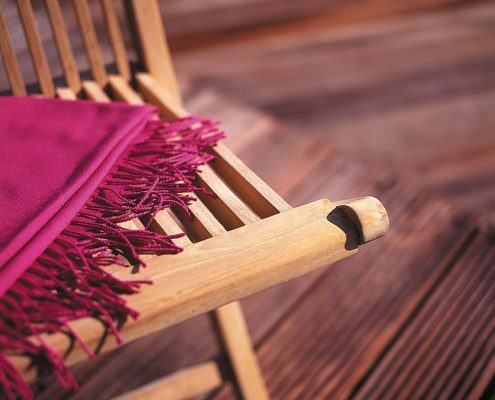 If you are committed to maintaining your timber decking, it can last a life time. Timber decking requires a little bit of TLC twice per year. This entails cleaning, treating and either staining or oiling your deck depending on your preference. On the other hand, composite decking requires very little maintenance but its lifetime is limited to around 20-30 years. The only maintenance required for composite decking is regular cleaning – no need for treatments or oils to ensure your decking looks its best. Due to its plastic content, composite decking can be prone to scratches, these scratches can be trickier to repair than a scratch on a timber decking as you cannot sand down any superficial flaws on composite decking where as you can use this method on timber. 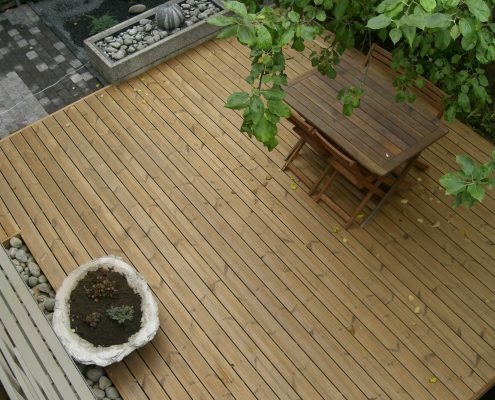 The cost of timber decking depends on the type of wood you wish to use. A softwood decking – like pine- is a considerably cheaper solution in comparison to both hardwood decking and composite decking. Hardwood decking and composite decking are similar in price but keep in mind, by opting for a timber decking you will also need to purchase oils or stains to prevent the timber from cracking, splitting, rotting and greying over time. As long as the timber used for your timber decking is responsibly sourced, it can be one of the most environmentally friendly materials that can be used. Composite decking is made from a combination of wood fibres and plastics. The wood fibres are often manufactured from recycled materials and if you choose your supplier carefully the plastic content may well be made from recyclable materials too. A major drawback of composite decking to consider when making your choice is the strength of composite decking, or should we say lack of strength when compared to a traditional timber deck. Although composite decking may not have the same strength as timber decking, this issue can be resolved by placing joists closer together to support the decking, however, keep in mind that this may increase the cost associated with building a deck. Both composite and timber decking have their own advantages and disadvantages when it comes to the look and feel of the product. Composite decking is available to purchase in a range of colours and finishes whereas, if you want a coloured timber decking you would need to take the time to paint it yourself. Composite decking is also less slippery when wet in comparison to timber decking. Poorly maintained timber decking can results in splinters whereas composite decking can be easily scratched. Each board of composite decking will look identical whereas timber decking will have variances in colour and may even have knots throughout. Ultimately, the choice between composite and timber decking is yours to make. BHC Merchants stock a range of of composite decking, timber decking and all the necessary products you will need to look after your decking. https://bhc-merchants.co.uk/bhc/wp-content/uploads/2017/08/GRIPSURE-IMAGE.jpg 728 1347 Nicola Young https://bhc-merchants.co.uk/bhc/wp-content/uploads/2017/06/BHC_Merchants_Logo_156px.png Nicola Young2017-09-29 15:59:132017-09-21 15:53:34The difference between Timber Decking and Composite Decking. We deliver to you. Gift cards now available!